Every year during the feast of the Passover, the Holy Family went to Jerusalem. The Gospel of St. Luke tells of one particular trip when the twelve year old Jesus remains behind in Jerusalem. Mary and Joseph don't know this however. Mary thinks Jesus is with Joseph and Joseph thinks He is with Mary. This could easily happen because the women and men would travel in separate groups and Jesus was at the age when he could be either with His father or His mother. Mary and Joseph do not notice He is missing until an entire day passes. Can you imagine the anxiety they felt? They lost the Christ Child. When realizing He is not with either of them, they look for Him among their family and friends. Much to their sorrow, they do not find Him so they quickly return to Jerusalem. Ones again Mary does not fully understand but she humbly accepts what He says to her. Jesus goes on to set a wonderful example. Jesus, the King of Kings, goes home and is obedient to them. Peace will penetrate your life when you follow the example of Jesus here and you become obedient first to God, then to Church authority and lastly to civil authority. The Bible passages for Finding Jesus in the Temple were taken from the timeless Douay-Rheims Catholic Bible. If you are looking for a more modern language version of Finding Jesus in the Temple, our recommendation would be the St. Ignatius Press Bible. If you would like to read the full scriptural account of the Finding Jesus in the Temple can be found in Luke 2:41-52. Here are some additional thoughts to enhance your meditation on Finding Jesus in the Temple rosary mystery. Return often to this page when you are praying the Joyful Mystery of the rosay - Finding Jesus in the Temple . Jesus could have come at any time but He chose to come as a baby so He could experience all that we experience. He wanted to be helpless and dependent as a young child. He grew from a baby to a child then into adulthood. This way He could be an example to all age groups. Childish behavior brings to mind a not so virtuous state. But a simple trust in God, docility, and the good intentions of childhood are things that should be strived for. At that hour the disciples came to Jesus, saying: Who thinkest thou is the greater in the kingdom of heaven? And Jesus calling unto him a little child, set him in the midst of them, And said: Amen I say to you, unless you be converted, and become as little children, you shall not enter into the kingdom of heaven. Whosoever therefore shall humble himself as this little child, he is the greater in the kingdom of heaven. And he that shall receive one such little child in my name, receiveth me. During this mystery remember that you must be childlike to be saved. The Holy Family went to Jerusalem for the Passover, a religious observance. Following the example of the Holy Family, you should strive to live, work and pray as a family. 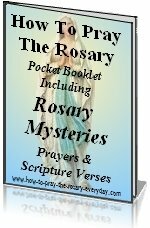 Saying the daily Rosary as a family is a good way to accomplish this as well as attending Mass and other religious events together whenever possible. At Passover, a lamb was sacrificed. Jesus, the lamb of God was present at the sacrifice which was a prefiguration of Himself. Jesus said, "I must be about my father's business". Young people should pay attention to this. You are never too young to ask yourself what does God want from me. And more importantly to go to God in prayer asking Him to tell you what His plan is for you. From the age of twelve, Jesus was concerned about His Father's business. Jesus grew and became strong. He was engaged in physical labor at the side of His foster father, Saint Joseph from a young age. Children should contribute to the family and parents should be patient, loving examples for their children. Mary wasn't a "scholar" or an academic. But she is a perfect model here. Again, she is pondering the events in her heart. Higher education is good, but the most important education you can seek is a deeper understanding of the ways of God. 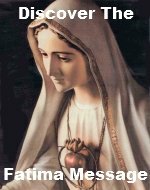 Follow Mary's example here and keep all the words and acts of Jesus in your heart. Consider this verse, "Jesus advanced in wisdom, and age, and grace with God and men." As children develop physically, they also should be growing in virtues. Young people should know, love and serve God. They should respect adults and be obedient to their parents and teachers. And they should always be a good example to their friends and treat them with kindness. These are the duties of the young. The duty of parents is to teach their children these virtues. Mary is such a wonderful example of patience. She displayed patients in all her sorrow. Losing Jesus too was a sorrow, the greatest sorrow any mother could ever endure. Strive to imitate Mary's patience in your times of affliction. In your times of anxiety you can turn to Mary with confidence because she knows how you feel for she too suffered anxiety at this time as she searched for Jesus. Her consolation for being so patient was finding Jesus in the temple safe and sound. Though through no fault of her own, Mary missing Jesus these three days can be related to those who lose Jesus' life in their souls when they commit serious sin. To have the light then to be deprived of it is a great sorrow indeed. If you ever do fall into serious sin, make it a priority to receive the sacrament of Penance right away. Do not seek Jesus in vain. He can be found in the Catholic Church and He is waiting there for you. Do not misunderstand Mary's words as a rebuke. Quite to the contrary, it should be viewed as a loving complaint. Yes, she was overjoyed when finding Jesus in the temple but she may also have supposed she had done something that caused Jesus to leave. It is a great suffering indeed for a person who loves God to fear they may have done something to offend Him. Consider again Mary's loving complaint..
"Son, why hast thou done so to us? behold thy father and I have sought thee sorrowing." Finding Jesus in the temple is a prefiguration of the three days Jesus was in the tomb. Dear Lord, God almighty, let me remember with great joy the times I have found Jesus after I had gone astray. Thank you for your great example of doing the will of your Father, so I inturn can follow your perfect example. Grant me that in all my quests for knowledge and peace, I may never suffer the loss of Jesus the only source of true peace.